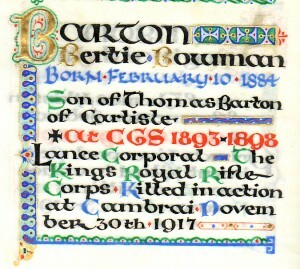 Family Background: Bertie Bowman Barton was born just 366 days after his only sibling Henry. They were the two sons of Thomas and Martha (nee Bowman). Thomas was brought up at 1 The Crescent, Carlisle. According to the census returns he was there from 1841 to 1881, living with his family. The family firm was located behind the house. In 1881 he was there aged 48, living with his widowed mother, probably with everyone assuming that he was a confirmed batchelor! In just under three years by February 10 1884, he has married and the father of two sons! In 1891 the family was living at Bothcherby Grange. However within another two years, Thomas had died (Sept 22 1892) and the boys were under the guardianship of their batchelor uncle Robert, and Bertie was living at no 1 The Crescent with Robert and their maiden aunt Elizabeth. The Bartons were a fairly wealthy Carlisle family. Thomas and Robert are listed as coach builders on all census returns up to 1891, and their father had started the business. They built horse drawn coaches and then went on to train coaches. The National Railway Museum in York has one of their coaches. Robert sold the business as a going concern sometime after Thomas died. The family had connections back to Wigton where Bertie’s grandparents and great grandparents are buried. Robert describes himself as a farmer on the 1901 and 1911 census. Robert died in early 1917 and left his considerable fortune to Bertie. Bertie’s mother came from Newcastle,where her father had had a printing business, but it seems to have been on a smaller scale than the Barton business. She was nearly twenty years younger than her husband. No trace of her can be found after the 1891 census. Bertie’s brother Henry pursued an army career; he was gazetted to the 3rd West Yorkshire Regiment (Militia Battalion) July 1901 and served in the Boer War 1901-1902, then gazetted to the 1st East Yorkshire Regiment in 1904. He resigned his commission in 1907. Fettes records put his death between 1909 and 1922. As Robert left everything to Bertie it seems likely that Henry died before 1917. Bertie married Gertrude Frances Crofts Pearson on December 9 1909 at St. Georges’s Hanover Square, London. In 1911 they were living at Windsor Mansions, in London, Bertie described himself as a law student. No children have been found. Academic Record Bertie and his elder brother Henry both attended the Grammar School and then went on to Fettes College, Edinburgh. Bertie then went to Trinity Hall Cambridge, graduating with a BA in 1908, becoming a barrister. “The night of November 29 was fairly quiet, but at 7.45 am on November 30, the Germans made a strong attack on the 12th Division, which was on our right, and succeeded in piercing their line. They broke through Lateau Wood in great numbers, and thus got right behind our four companies, as we were in position north-east of the wood. At this time all was well with us in front, and Battalion Headquarters were in communications with our outpost company, ten minutes later this line was cut. The events that followed were dramatic. Twice the Germans made desperate frontal attacks, but were splendidly repulsed by rifle and Lewis gun fire, and many Germans bit the dust. Then we found ourselves attacked on three sides – in front, rear and right flank. Fierce fighting followed, and the casualties on both sides were very heavy. Very few of the men and none of the Officers, succeeded in getting away. Other: Bertie’s wife Gertrude inherited nearly £20,000 as Bertie had inherited so much money from his uncle earlier that year. Gertrude died in 1962 never having remarried. She was still putting memorial notices for Bertie in newspapers in 1941.